The headlines are now informing Madoff and other Ponzi Scheme victims about the most recent piece of bad news. That is the word “claw back”. 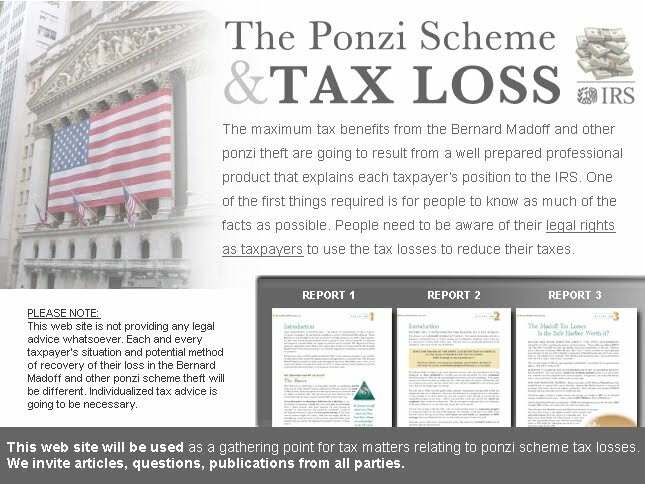 In short, investors who received cash investment returns from a Ponzi Scheme in excess of the actual invested funds are being forced to pay that excess cash back. HOWEVER, THESE “CLAW BACK” PAYMENTS WILL BE TAX DEDUCTIBLE. Those victims that are hit by a “claw back” may or may not have a choice about when they can deduct any moneys they repay as a “claw back”. Whether they have this choice could mean a big difference in the amount of money in tax refunds that will be payable to the “Claw Back” victim. Mr. Smith invests $500,000 in 2005 and earns and pays U.S. income taxes on $125,000 in 2005, $125,000 in 2006 and $125,000 in 2007. In 2008 Mr. Smith withdraws all $875,000 from his Ponzi Scheme account and closed the account. Assume Smith paid in the 35% tax bracket on his $375,000 in earnings for total taxes paid of $131,250. Assume Mr. Jones made the same investment but never withdrew any funds. Jones loses $875,000. Assume that the $375,000 of “earnings” is “clawed back” from Mr. Smith but not paid back by Mr. Smith until 2011 when all the litigation was settled. The law is clear that moneys clawed back from Mr. Smith, for which he had paid taxes on, would be deductible by Mr. Smith in the year 2011 when they were paid back. But what if Mr. Smith had very little income for 2008 and 2009 and 2010 and 2011 and used and carried back his $375,000 in losses in those four years, where would he be? The value of Mr. Smith’s tax refunds for the deducted repaid amounts in those years might be based on tax brackets that average 18%. In that case Mr. Smith would receive a tax refund of $67,500 even though Mr. Smith has paid taxes of $131,250 in prior years on the claw back income. There is a solution that will provide for a full return of all of the taxes paid by Mr. Smith of $131,250 plus interest. However, that solution may not be available to any Taxpayers that have filed previously and received tax refunds while making use of the “Safe Harbor” rules published by the Internal Revenue Service in Rev. Proc. 2009-20. The “price” of enjoying the Safe Harbor rules was to waive the Taxpayer’s rights to make use of a particular Code Section in the Internal Revenue Service that provides for this tax fairness. Code Section 1341 of the Internal Revenue Code provides that under certain circumstances Taxpayers who have received funds that they have reported as taxable income that must be paid back at a future time will have a choice. They can deduct the funds that must be paid back in the year in which the payment is actually made, or go back to the years that the income that is being repaid was reported. This refund is determined by calculating the actual year of income and excluding the repaid amount. It eliminates the repaid income from the Taxpayers’ taxable income for that year, thus recalculating the amount of taxes due and providing for a refund of excess taxes paid on the money returned from prior years. This Code Section is very valuable in the event a Ponzi Scheme victim must pay back funds in a year in which the victim is in a very low tax bracket and those same funds had been reported in a prior year in a very high tax bracket, like Mr. Smith. Those Taxpayers who did not rely on Rev. Proc. 2009-20 should be able to rely on Code Section 1341 to increase the amount of their refund, if appropriate. Furthermore, refunds paid pursuant to Code Section 1341 will carry interest from the prior year’s date for the amount of the overpayment. This will be an extremely useful tool to investors suffering from claw backs in a Ponzi Scheme. The use of Code Section 1341 can increase tax refunds and interest payments by 100% and more.